Near 80 degree temps and scattered storng storms..
Showers arrive overnight as a warm front lifts north. Highs near 80 come Monday. A cloudy start and end to Sunday really protected the area from seeing any thunderstorm development especially with a warm frontal boundary near by. Showers continue to push through the area overnight as the front lifts north putting us in the warm and very unstable air. With that said Monday holds a better chance for showers and storms as a cold front presses in from our west. High temperature Monday will be near 80 degrees with dewpoint values climbing toward 60 making for the perfect environment for thunderstorms to form. The strength of the storms will be dependent on the aforementioned factors above plus the timing of the main source of energy (i.e cold front) swinging through. Right now it looks like the best threat for severe weather will be down across southern Maryland, northern Virginia, and much of the Carolinas. The main threats with any of these storms as they pass on through looks to be high wind gusts, heavy rainfall and vivid lightning that is capable to produce power outages. We are not looking at a big event here with many locations north of Baltimore missing out on any type of storm activity. The tornado threat looks to be very low with this event along with the hail potential since the cold air is slow to arrive in the upper levels above. Most of Monday looks dry to start. Temperatures will be right near 60 degrees to start before surging above 70-75 degrees at lunchtime. Most locations will end the day right around 80 degrees with a "case of the muggies" something that we usually see in Baltimore during the dead of Summer. With the mugginess in place and heating of the day storms should begin to blossom. Timing for storms looks to be after 5pm with the heaviest activity south of the city during the late evening rush. 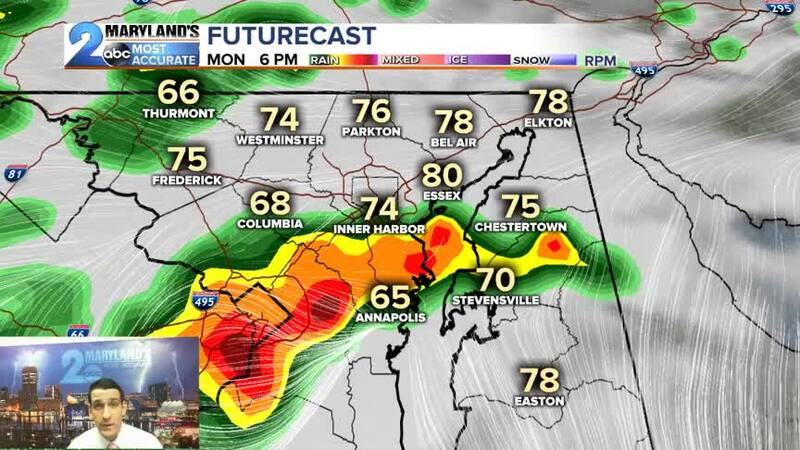 Storms look to continue to push through most of the area and onto the Eastern Shore after 9-10pm Monday night. Storms will be moving pretty fast so we are not looking at any flash flooding concerns. Once the storms pass through the humidity will drop off going into Tuesday but temperatures look to stay mild. Highs Tuesday will be back in the mid 70s before the chill returns midweek. Since the event could impact your evening commute or after school it activities why not download our free WMAR2News mobile app. This app will come in handy since we are now in the start of severe weather season and can keep you informed when it comes to warnings issued for your area. On a side note when it comes to severe weather. Today marks the start of Severe Weather Awareness Week (April 7th-13th). During this week we like to teach you about severe weather and how to plan for it. On Wednesday April 10th the Maryland Statewide Tornado Drill will take place at 9:45am. This drill like many others is used to help us develop an action plan for when a watch or warning is issued.